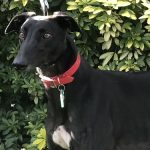 Greyhound Lifeline > Greyhound Lifeline Blog > Penny’s Greyhound Blog : Are Greyhounds Misunderstood? 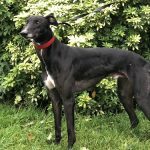 Penny's Greyhound Blog : Are Greyhounds Misunderstood? 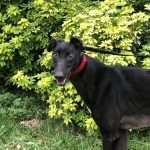 As a newbie to blogging and for Greyhound Lifeline, I’d first like to say hello and welcome! I hope you enjoy reading these blogs and if you have any comments please do feel free to join in. If I had a chocolate brownie for every time I’ve heard this one, I might be some way on the road of my brownie recovery program. 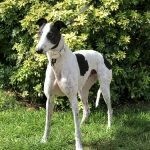 The lean, sleek and stunning form of a greyhound always reminds people of what they were bred for – running. So I guess it’s natural that people assume they need to run a lot, for miles and several times a day. 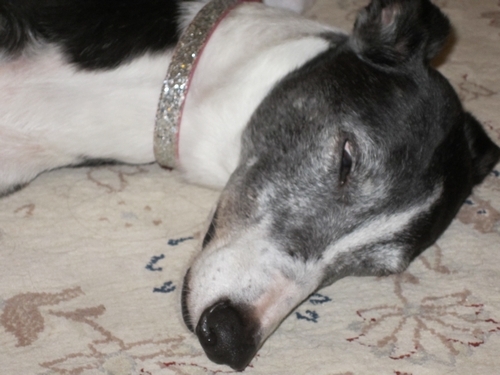 Whenever I meet people who want to talk to my greyhound Suzie, they always say things like “I bet you get fit keeping up with her!” or “You must spend hours walking her!” In fact – it simply isn’t true. Of course greyhounds do need a chance to have a good run regularly and of course they do need exercise, like any dog. However, after a short burst of flailing tail and blurred legs they normally come back, tongue lolling, ready for a lay down. They are not an endurance breed. They are often called the 40mph coach potatoes and although I don’t know who first said this, they were completely correct! They are the most low maintenance dog I know of and so are perfect for would be dog owners who cannot meet the needs of a more demanding breed. Just ask a spaniel owner how often their pet is actually worn out. If you can get their attention from behind the bouncing ball of energy attached to them! 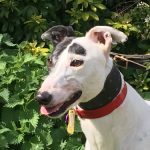 Suzie does love to stretch her beautiful legs in the sun but then returns to quietly sniffing, and pottering around on her walks. As soon as we get home she waits patiently for her treat (she’s trained me well) and then pootles off happily to lay down. It does take her time to cool down in hot weather but as soon as she can, she’s back on her bed – nose buried in the cushions and legs twitching. Really the thing that she needs more than anything is some gentle affection and what she gives back to me in kind is immeasurable. 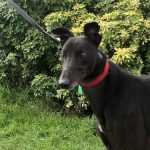 People think that they couldn’t have a rescue greyhound because they’re not fit enough, haven’t got hours and hours a day to exercise them or their garden doesn’t look like a race track. THINK AGAIN. 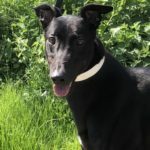 The actual recommendation is 20 minutes twice a day for a younger greyhound and gaps between excursions are either sleep filled or attention occupied. You can manage that can’t you? Of course you can. As long as you are confident they are physically fit enough and content in themselves (ie: spend 90% of their day asleep!) then you are doing fine. Just remember their life in the kennels and think how lovely a retirement with you will seem. They have worked hard and deserve some love and peace. Brilliant post Penny, and totally true. I have a whippet-lurcher and I get those kind of comments all the time. In fact, she sleeps more than my cat! And that’s saying something. And hey, if you ever need to find a home for any spare chocolate brownies just give me a shout….